In case you were curious where the Soyuz craft are docked on the International Space Station, Italian astronaut Samantha Cristoforetti has shared information as she goes through her training for a scheduled trip to the ISS next year. In the pictures I have shown the four docking ports that a Soyuz can fly to: the Service Modules aft (yellow, an ATV is docked in the picture); Docking Compartment 1 and MRM2 (green, Soyuz or Progress docked in the picture); and MRM1 (red, port is free in the picture). Today she was practicing Soyuz manual docking though the Soyuz normally docks automatically. Our manual docking training covers for two types of contingency: a failure of the on-board computer and a failure of the Kurs, which is the systems of antennas (both on the Soyuz and on Station) that gives the computer the necessary information about the relative position and speed with respect to ISS. 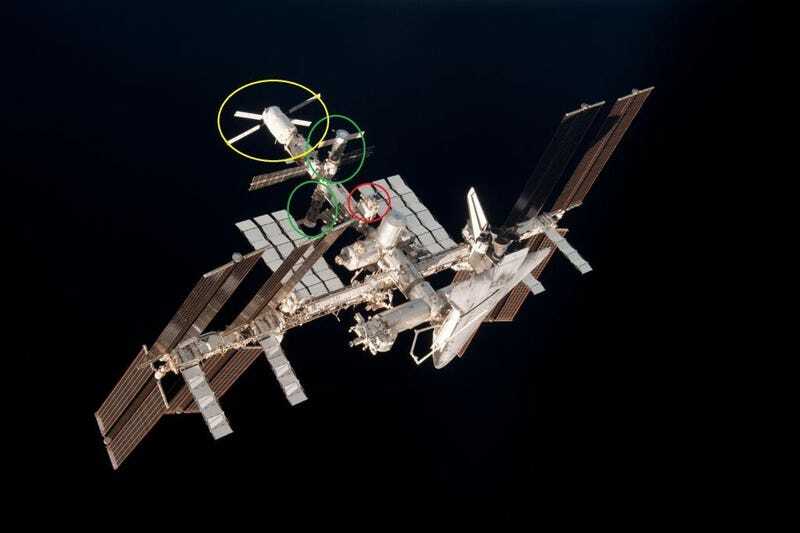 Cristoforetti has also been training on docking and undocking the ATV-5 resupply vehicle.